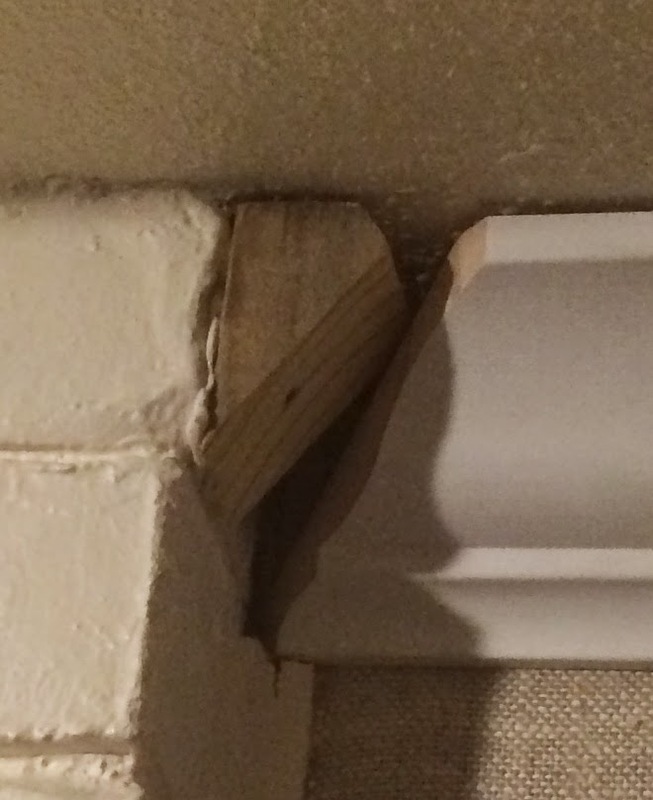 I spent quite a bit of time last month installing crown molding for my wife, and I thought I'd show some of the kludges I've come up with. One of the problems is attaching the crown molding to brick. My nailgun isn't going to blow nails through brick. So I cut triangles (sorta) out of a 2x4 and used Liquid Nails to attach it to the brick. The picture to the left is the first backing block I put up. I traced the angle from the back of the molding and then cut down that line. I let the Liquid Nails set overnight, and then nailed the molding to that. Our crown molding is actually 3 pieces. The picture above is just the actual crown. Below that, I put a row of dental molding, and shoe molding above. I needed to attach the dental to the brick directly, but it and/or the brick wasn't straight and it wouldn't hold by itself long enough for the Liquid Nails to set. The picture to the right is the first way I tried to hold it in place overnight. 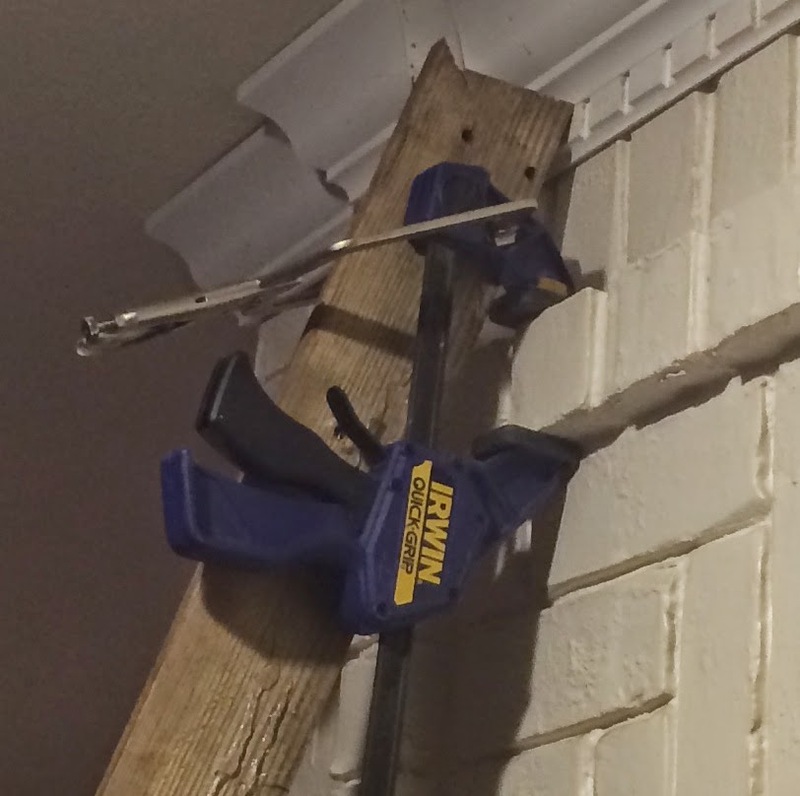 I have a 1x4 clamped to the top of the ladder's feet, and that is pressing against the dental molding, so the feet aren't quite touching the brick. It only worked well enough to hold one side, though. When I took the ladder off the next day, the left side came loose again. So I found another way. There was just enough brick ledge to get a clamp on, and then I clamped the 1x4 to the first clamp. This way I could put pressure right where I wanted it, and put more controlled pressure than the leaning ladder anyway. The first problem I had though, was just trying to get the crown molding up to the ceiling. 16 foot segments are just too long, and our ceiling isn't straight, either. Somehow, I've lost all of the photos, but the first thing I tried was standing the ladder next to the wall and clamping the 1x4 at an angle. The notch you see in the last held the bottom of the crown, and let me put it at the right height. But it never quite worked right (which turned out to be mostly the crooked ceiling) so I found another way. First, I bought these hooks from Lee Valley. There are other hooks, but these are adjustable. I didn't actually use the adjustment much, but it helped a couple of times. But they are a LOT more expensive than the others, so you'd probably do fine buying the others. Or just making your own; I saw one made out of a coat hanger. Anyway, I bought 4 of these, and that let me get the molding much straighter and closer to correct. Then, I found the image to the right. Once I made one for the molding I was installing, I was able to get the molding as close to the correct angle as possible. With my ceilings, it still didn't make it perfect, but it was much better than just going by feel against the wall. I finally got the Frantz oil filter installed on the F350 6.0 Powerstroke diesel. I had to order new adapters because the pressure sensor wouldn't fit the any of the fittings that came with it. It took me a while to decide where to put it, and I finally realized that the bolts holding the hood on weren't actually over the side panel rails. So I could mount the filter bracket there and it barely has enough room. I'll have to keep an eye on it to make sure it isn't vibrating against something, and I didn't consider the heat build-up. I don't know what it is that it ends up sitting on, but the oil line is running right against the air conditioner line. So that's going to affect the AC efficiency, at least. Anyway, I've got my before and after oil samples put together, and I'll send them off to Blackstone this week. Since I've already put 10,000 miles on the oil, I know there's no way it's going to come back saying it's still good, but I can at least see what the difference is between the two. If it makes a mess the first time I change the toilet paper roll, I'll probably end up moving it under the truck. But it's not supposed to and part of that mess-free experience is based on it being able to drain the oil out. It can't do that if the filter is mounted lower than everything else in the truck. My return is running into my oil cap, so there's really nowhere I could mount it that would be above that. But I can open the hood and now the filter is above everything. Of course, I don't have a lot of confidence. The "before" sample was taken by running the truck up to operating temperature and filling a sample bottle from the return line without a toilet roll in the canister. Then I shut the truck off and waited a few minutes before opening the canister. It was still hot, but wasn't gurgling. Luckily, I turned it down before I opened it, because it was almost completely full of oil. The guy that sold it to me, Ed Greany, has a video where he says he lets it drain overnight, so maybe when I do that, it will be fine. We'll see in 500 miles or so (the first change is supposed to be at 500 miles). We may see even before then, since I bet Blackstone comes back telling me I'm stupid to have let my oil change go this long. When they do, I'll change the oil and the TP roll, with another before test done before I change it. (And probably a virgin oil sample just for future comparison). I left it in so long because I wanted to get this filter and get it installed and tested with dirty oil. Plus, I have a sticking injector now, and I want to see if the Frantz filters out enough stuff to get that cleaned up. It's probably too far gone to fix without additives, but we'll see. If it doesn't get better over the next week or so, I'll probably go find something to pour in there. I went to check on the hive today. It's too cold to open, so I just stick my ear to the side to see if I hear them; no sound today. I knew the hive was small, and was afraid it wasn't going to survive, and apparently I was right. I didn't take pictures (because it is awfully cold out there) but from everything I could see, they simply froze. There wasn't any honey where they were, but judging by the bees that had their heads stuck in the comb, the cluster was only about 2 inches across. I'm taking the opportunity to cut down a couple of the frames that had been built out too much. I've mentioned in the posts before that I was trying to do some foundationless frames. The bees built the adjoining frames thicker into the empty space instead of building comb in the foundationless frame. So now I can cut those down to their proper thickness. I'll probably split the comb into two boxes and install two packages in the spring. Then I'll use the rest of the comb as bait in other boxes to try to trap swarms. Maybe I'll get lucky. There's also a woman at work that thinks she has a hive under a water feature in her yard. I'll try to capture that as well. Maybe next year will be better. I still don't know for sure why they were weak in the first place. Maybe we installed them too late, and they missed the spring flow, or the drought kept the flows from being large enough. I don't see signs of disease, but I may also just not know what to look for. The queen was unmarked, so something may have happened to the queen late in the season and stressed the hive that way. Or there may have been more varroa than I thought. At least next time I'll have more than one hive, and I can compare them. I'm thinking about calling the apiary inspector to come out and look it over, but I don't know if I can do that since I haven't actually registered yet. I don't know what he'll say if he comes out and the hive isn't branded (which is required in Texas). We watched "Into the Woods" the other day. Definitely not worth the money. The story was alright, (although my wife said it didn't make any sense to her), but the music was pitiful. I haven't watched a musical in a while, but I seem to recall them having several tunes. This one seemed to just have one or maybe two tunes in the whole thing, that they just kept singing different words to. And the tunes were so repetitive that it seemed they were just a flimsy excuse to sing instead of talk. It wouldn't have been worth seeing at the dollar theater.